Fall harvest is around the corner. Before you hit the field, give your combine a once-over with this 12-point checklist. Clean the machine of dust and dirt for better operation, and to help spot wear and potential problems. Attach headers to combine and make sure they work, checking height and contour controls. On the grain table header, inspect sickle blades and guards, and inspect teeth in augers and reel. On the corn head, inspect gathering chains, and sprockets, and adjust width of stripper plates. Check and adjust drive chains. Remember: Row-unit gearboxes operate as mini-transmissions and need to be checked once a year. Refill with grease or oil depending on age and brand of corn head. Check all belts for wear and replace as needed. Check all chains and bearings for wear; replace chains that can’t be adjusted or tensioned correctly. 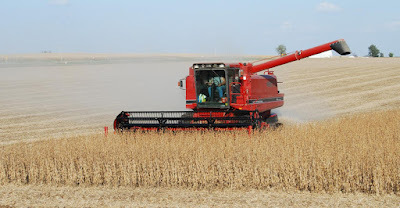 For axial combines, inspect rotor and concave, checking wires for damage and bars for wear. Check unloading system auger. If edges are sharp like a razor blade, replace. Perform service checks: engine oil, fuel filter, air cleaner, and hydraulic oil. Grease all points per operator’s manual. If a fitting doesn’t take grease, stop and find out why. Safety first … and last. Inspect all lights, flashers and reflectors for travel by road. Call All States Ag Parts at 877-530-4430 for all your tractor and combine parts needs. We have the largest inventory of used combine parts in the country and have greatly expanded our new and rebuilt combine parts selection.